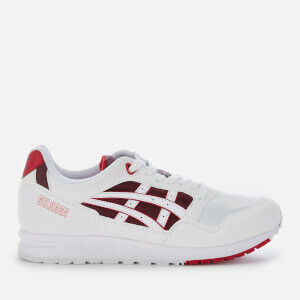 Men’s retro white trainers from Asics. Originally released in 1991, the ‘Gel-Saga’ sneakers have sports-inspired technology and Asics’ GEL technology for cushioned comfort. The low top trainers are designed with vibrant orange details, contrasting green sections and signature tiger side stripes. 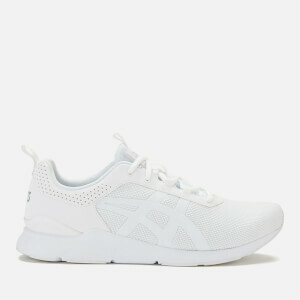 The comfortable trainers sit on a cushioned EVA midsole with Asics’ GEL technology to absorb shock and a textured rubber outsole for added traction. Complete with Gel-Saga branding on the heel, perforated details and a signature logo on the tongue and heel. Upper: Synthetic Leather/Textile. 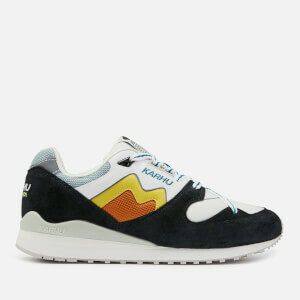 Midsole: EVA. Sole: Rubber.